Grand prize winner Curtis Fisher with science fair organizer Jackie Hermann. 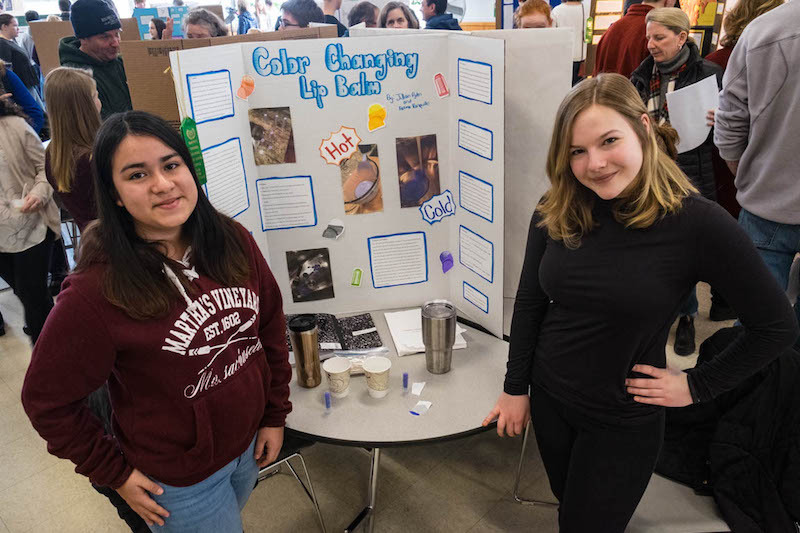 More than 60 students presented their projects Saturday morning at the annual high school science fair, organized by science teacher Jackie Hermann. 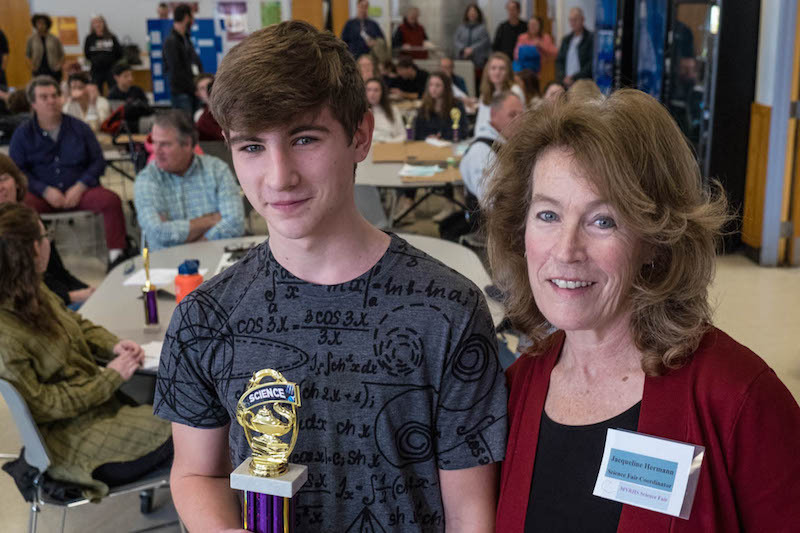 Two dozen scientists and engineers from the community served as judges for the fair, and each project was reviewed at least three times on Friday. “We process well over 200 score forms, and the judges say the same thing every year: there’s hope for the future,” said Ms. Hermann. 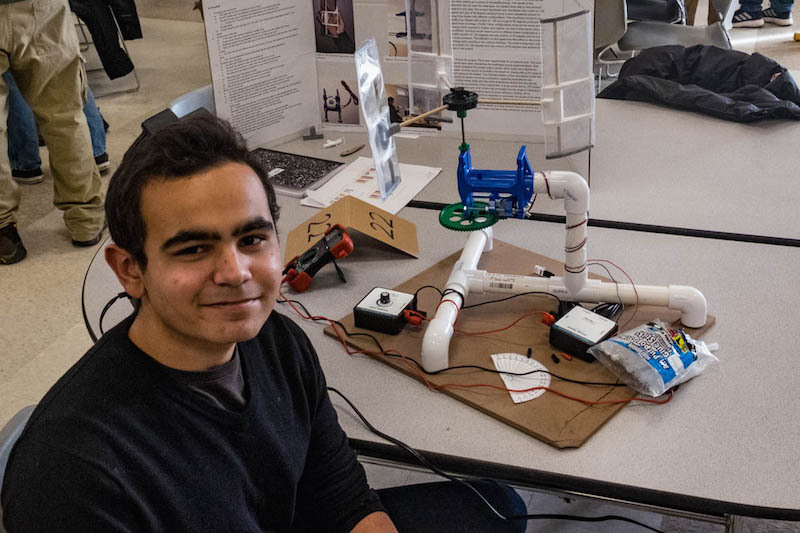 That hope springs from projects like sophomore Owen Favreau’s project titled Urban Turbines. Using an architectural design app and the high school’s 3-D printer, he created a wind turbine small enough to fit on a table. His goal is to harness wind energy even in the close quarters of a city environment. The project won second place overall at the fair and a special sustainability award. “Even if it’s not associated with school, continuing to tinker with it sounds fun to me,” Owen said. Freshman Charlotte Packer’s investigative project titled How is Nitrogen Getting Into Lake Tashmoo? won the Lagoon Pond Association Award for addressing issues of water quality. She tested various waterways around Lake Tashmoo for nitrogen levels to try to identify sources of the pollutant associated with wastewater and fertilizers. Curtis Fisher’s grand prize-winning project also addressed environmental monitoring. The senior created a wireless sensor network to help collect data from environments both under and above water. The sensors can be programmed to help measure dissolved oxygen, pH levels, nitrogen levels and temperature, among other things. “It’s to make life for ecologists easier so they can collect more data without making a trip,” he said. His project was funded in part by a grant from the Marjot Foundation, which supports young environmental researchers. His sensors are designed to be used by ecologists on the Island. The fair was funded entirely by community sponsors. Up to 12 of the projects presented will be advancing to the regional fair on March 10 at Bridgewater State College. First Place Grand Winner: Curtis Fisher: A Community Connection: Engineering A Modular Platform for Environmental Sensing. Second Place Grand Winner: Owen Favreau: Urban Turbines. Third Place Grand Winner: Vito Aiello: Designing A Combined Solar-Hydroelectric Power System. CatherineCherry: Building a Dual Axis Solar Tracker. Katherine O’Brien: Peltier Tile Portable Charger. Jaiden Edelman: Solar Powered FM Transmitter. Ava Maggi: How the Height of A Field Hockey Skick Affects the Distance of the Ball. Katie Morse: Carbon Fiber Heated Socks. Joseph Serpa & Kenny Hatt: Solar Powered Emergency Shelter. Michael Wallace and Finley Monahan: Sports Drinks vs. Orange Juice - Electrolyte Count. Ruby Reimann and Chloe Combra: The Effect of Various Temperatures On the Decay of Fruit. Charlotte Packer: How Is Nitrogen Getting Into Lake Tashmoo. Anna Nitardy: Engineering A Water Desalination Kit. Kya Maloney & Megan Zeilinger: The Sound of Science: Testing Different Lengths and Pitches of Pipes to Create A Fully Functioning Xylophone. Vito Aiello: Designing A Combined Solar-Hydroelectric Power System — David Brand Award. Owen Atkins: The Effect of Pre-Soaking Seeds On the Rate of Germination — Island Grown Initiative Award. Charlotte Packer: How Is Nitrogen Getting Into Lake Tashmoo? Lagoon Pond Association Award. Anna Nitardy: Engineering A Water Desalination Kit — Marine and Paleobiological Research Institute Award. Curtis Fisher: A Community Connection: Engineering A Modular Platform for Environmental Sensing — Martha’s Vineyard Surfcasters Association Award, provided in memory of Phillip M. Upham. Owen Favreau: Urban Turbines — Sustainability Award. Curtis Fisher: A Community Connection: Engineering A Modular Platform for Environmental Sensing — Sheriff’s Meadow Foundation Award. Michael Wallace and Finley Monahan: Sports Drinks vs. Orange Juice: Electrolyte Count — Biology Award. Jaden Edelman: Solar Powered FM Transmitter — Physics Award. Jillian Pyden and Fatima Ronquillo: Color Changing Lip Balm — Chemistry Award. Catherine Cherry: Building A Dual Axis Solar Tracker — Technology Award. SCIENCE RULES! Great job MVRHS!